Take your easy go-to meal up a notch by making these healthy vegan 10-Minute Mexican Black Beans Recipe! 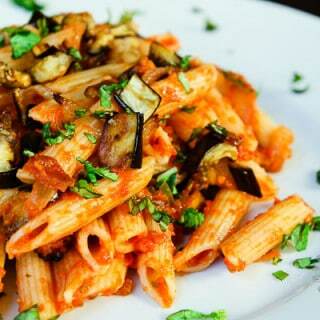 No extra time, ALL the extra flavor and deliciousness, and dinner ready in 15 minutes! It’s the middle of the week and you’re already exhausted with work, lacking sleep, dealing with the kids all week, and all the other things that go along with LIFE in general. I know you’re nodding your head. For these nights, everyone has their easy go-to, last resort weeknight meals when you really don’t want to spend more than 10-15 minutes in the kitchen, yet want that home-cooked meal. 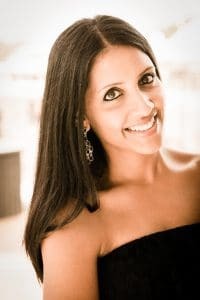 In fact, sometimes going out to eat or ordering in seems like more work. The first thing I do is check the fridge for leftovers and the freezer for my make-ahead meals (Creamy Carrot Tomato Sauce, Pesto, Black Bean Soup, etc.). Then I resort to our default which I KNOW the entire family will eat fuss-free…and for us, that’s Pizza or Burritos/Quesadillas. When I say ‘Pizza’, I don’t mean that I’m making my own dough, or even rolling out pre-made dough from Trader Joes. It means that I’m pulling out a Mama Mary’s Thin Pizza Crust (one of my favorites, and they make a pretty decent gluten-free one too!) from the pantry, throwing on some sauce, veggies, and vegan cheese. And MAYBE if I have the time or energy, I’ll throw some broccoli and mushrooms in the oven to roast prior to placing them on the pizza. Otherwise, it’s usually onions, bell peppers, fresh basil, and jalapenos. Toss it in the oven while I throw together a quick spinach salad or steam some broccoli. 8 minutes later and our meal is served. Our other default meal is Burritos or Quesadillas. On these nights, you won’t find me making my own beans from scratch or making anything fancy. Yes, even food bloggers who LOVE cooking in the kitchen feel this way sometimes! I literally open up a can of refried black or pinto beans, warm them up with some frozen spinach and corn added in, chop up some fresh spinach, tomatoes, and jalapenos and make either grilled burritos or quesadillas. Add a side of avocado and dinner is served in 15 minutes. 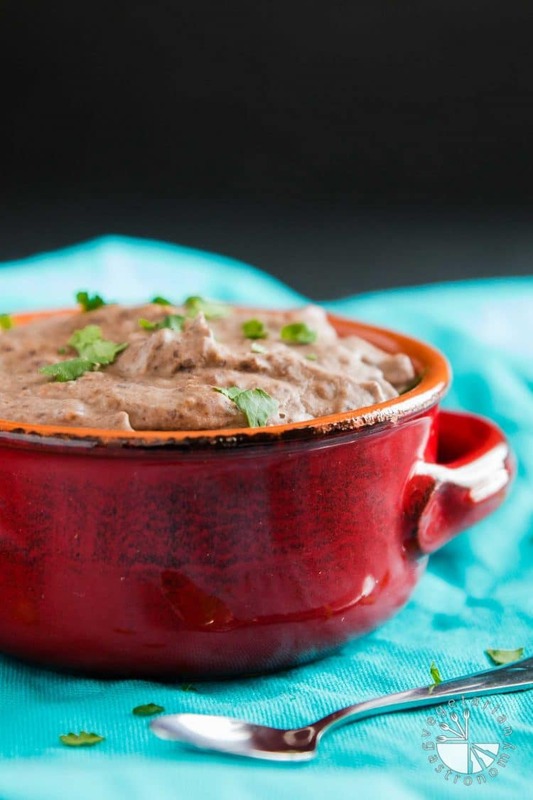 At this point, you may be wondering why I’m sharing a 10-Minute Mexican Black Beans Recipe if I just said I usually use a can of refried beans. Well, it goes something like the following. My husband’s been on call ALL week and we’ve barely seen him and my kids are driving me crazy. It’s time for Pizza or Burritos. I ran out of pizza crusts and canned refried beans. So I panic since it’s way past their dinner time, they haven’t showered, and my 4 year old is about ready to start her “I’m too tired to do anything” phase of the night. Then I see the cans of whole black beans I bought in bulk from Costco. I pull them out, along with a few other things from my fridge, throw everything in my blender hoping the kids won’t notice, and all I can say is WOW! I never thought these last minute blender beans would have them licking their plates clean and asking for beans on the side! These black beans tasted so much better than the canned refried black beans from the store, and they are so easy to make. My son was disappointing that I only made one cans worth because he wanted burritos for school the next day. This is a blender recipe, so there is cooking or sauteing any ingredients prior to adding to the beans to keep things simple. I also added in one of my favorite fridge staples to have on hand, cashew butter. It add some creaminess to the beans. You can also easily adjust the consistency of the beans by adding more water or cooking them longer depending on what you’re using them for (i.e. thicker paste to avoid leaking when spreading on tortilla vs. thinner when serving on the side with rice). Needless to say, I’ve now only been buying whole black beans and using this 10-Minute Mexican Black Bean Recipe instead of canned refried beans. This all still fits into my “Dinner on the table in 15 minutes” plan! Simply blend the ingredients, heat on the stove to get the right consistency while you’re chopping and heating tortilla, assemble and grill your burrito or quesadilla, and that’s IT! I’d love to know what your last minute go-to meals are in the comments below! Drain and completely rinse the 2 cans of black beans. Add the rinsed whole black beans along with the remaining ingredients into a blender (I used my vitamix). For an added level of spice, add some fresh jalapeno or paprika. Blend, using tamper to push down, until you achieve the desired consistency. I typically blend until just pureed and no black bean remains in-tact. Pour the black bean mixture into a non-stick pot and heat until you achieve the desired consistency by adding more water or cooking them longer (see notes below). Season to taste with additional salt if needed. Adjust the consistency of the beans by adding more water or cooking them longer depending on what you're using them for (i.e. thicker paste to avoid leaking when spreading on tortilla vs. thinner when serving on the side with rice). To Make Cashew Butter: I highly recommend making your own cashew butter and storing it in the fridge. It's so much better than the store-bought jars. To make cashew butter, simply add about 2 cups of raw unsalted whole cashews to a large food processor. Process for a total of about 10 minutes or until completely blended, creamy, smooth, pour-able consistency. During the 10 minutes, you'll need to stop frequently and scrape down the sides. Once done, you should be left with a creamy mixture of cashew butter. Empty contents into a sealed container and store in the fridge! Looking for more Mexican Black Beans Recipe? Oh it's so a mission...even for me and i LOVE cooking haha! Even though i have the kids all day, I can usually try to prep dinner earlier in the day, so working full time and then coming home to spend it making dinner I can imagine would be difficult! A big greek salad sounds great and filling...and I love sweet potato chips! Wraps are my lunchtime favorite, but unfortunately the kids and my husband aren't huge fans of them for dinner unless it's a hot wrap. Haha...life is great for us, I can't complain, but somehow things keep coming up and it's hard to get life to slow down. But we are very social people so I feel like we also do it to ourselves ha! Can't wait to try this as well. We tried using the dry beans method, but man that takes so long! After a few tries, i decided burritos (which are our quick-fix meal too) needed to be easier so i went back to buying the canned refried beans. I'll definitely try this method instead - canned, but healthier for sure. Can you elaborate on "grilled burritos"? We usually end up making bean & cheese quesadillas because no one wants a soft burrito. I used to use dry beans a LONG time ago, but like you said, it takes a long time. And yes...burritos SO need to be easier haha! 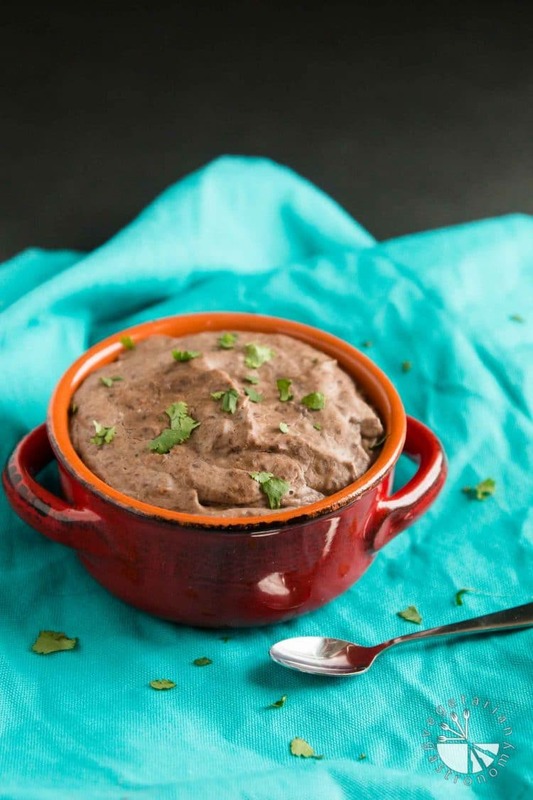 Canned refried beans were always in my pantry, but the past month or two I've only been making this quick blender recipe and we LOVE it! Also, if the cashew butter sounds overwhelming, it really isn't! Try it once and you'll love having a batch in the fridge to use whenever (it stays for a long time). If you do make it, I can suggest a few other great recipes that use cashew butter. Or I even add a spoon or two of it to any marinara to make a "creamy" quick pasta sauce and toss it with some lentil pasta + spinach for a quick healthy meal! Oh and GRILLED BURRITOS are the best! It's actually the ONLY way I'll eat a burrito. I can't stand the ones that are simply wrapped in warmed tortilla haha. I just grill the tortilla on both sides till lightly browned on the pan (with a little butter if you prefer). Then quickly remove from pan, fill the burrito (beans, spinach, tomatoes, avocado, cheese, etc. ), then wrap it up and place it back on the pan to grill both sides until crispy. If you wait too long to wrap the burrito, then the tortilla will be difficult to wrap up. I usually close up both ends of the tortilla for the kids so it's easier for them to eat (fold over tortilla, then fold both sides, and roll while you use a spoon to push the contents in). But you can also just make an open ended burrito and grill it that way (just don't flip). Let me know if that makes sense...super easy! Let me know if you try out this recipe! Oh and I also sometimes will throw in frozen spinach and frozen corn from TJ into the beans. Happy cooking! I have honestly never known how they get beans to be the texture they are at Mexican restaurants, but I love them. With rice or in a wrap--so yum. I realize this is your own unique spin, but it's genius! Cashew butter!? That is such a clever and healthier way to do it. And they look perfect! That cashew butter!!! Perfect base for a quick lazy day meal! How cool- I need to start making my own refried beans!!! We eat them all the time! Thanks Sarah! 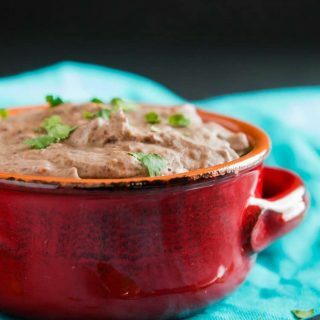 Then you'll definitely have to try out this recipe sometime...it's delicious and has become our new go-to replacement for canned re-fried beans! Sounds like a good solution to making a healthy meal. Thanks Julie! It's a staple in our house now for sure. The cashew butter is an interesting addition - I've never added it (or a cream/butter of any variety) to black beans or refried beans before! Oh it's so delicious!!! I've added cashew cream to mexican dishes before, but cashew butter takes it to another whole level! It's dangerously addicting, but so good! Not to mention it's super easy to make at home and much better than store-bought kind. This looks so good and I love that you have used cashew butter as a healthy fat instead of lard. What a great idea! Thanks Dahn! That's honestly exactly why I added in the cashew butter in the first place...not only to make them slightly creamy, but to add the healthy fat in for my kids! Ended up tasting really good! Nice recipe. Easy, healthy and tasty. Just the way we like it! Thank you! Exactly what it's meant to be! I love making my own black beans! SO YUM! I have never liked the refried beans from a can, just something about the taste. I make mine a little different than this, but I have a refried lentil recipe on my blog that is blender based too and we love it! Burritos is our go to meal over here as well. SO easy and all my kids devour them! Glad you found an easy go to, makes all the difference on those crazy days. 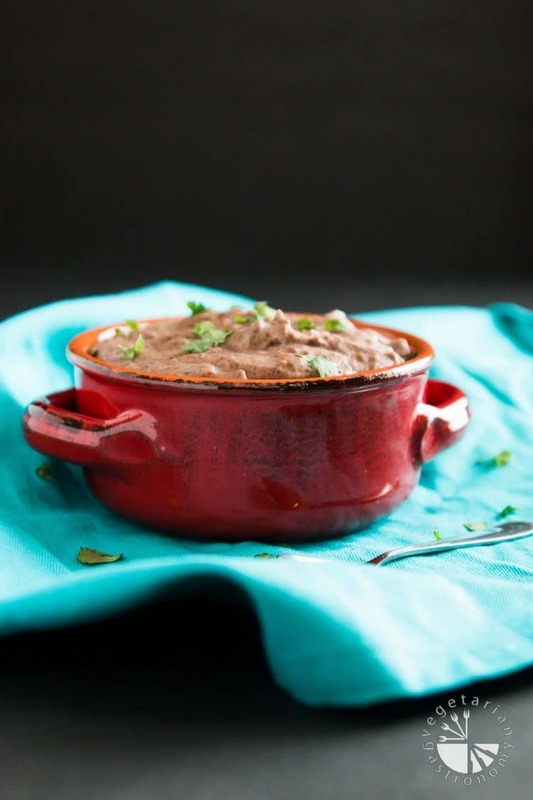 I've always been ok with the refried black beans from TJ...it was our go-to, but now it's been replaced with this recipe! so easy and delicious! And you're right, it's great to have an easy at home blender recipe instead of the canned refried beans! These taste so much better! I'll have to check out your lentil version sometime! Thanks Sophia! This dish looks amazing, some crispy pita chips to dunk in would be great! yeah I gotta agree, cooking and thinking what to make for dinner can be a hassle hehe but thats life hey! Well done on this lovely recipe and getting dinner on the table in no time with your hubby been away. Oh my kids would love your pita chip addition...they've been into them lately! Yes...even for a food blogger sometimes you just want quick and easy witout having to think! I always have spicy black beans ready to go. I love the idea of using a blender to get the refried beans texture. I usually use a potato masher, but I can see how this will make a creamier bean dip. Great idea! Thanks Linda! I preferred the blender vs masher because of the skin on the beans, plus, I had tomatoes and cashew butter in the mix and wanted to make it more of a creamy bean texture. I love the spicy version, but end up omitting it because of the kids ha! Like the ingredients in it. 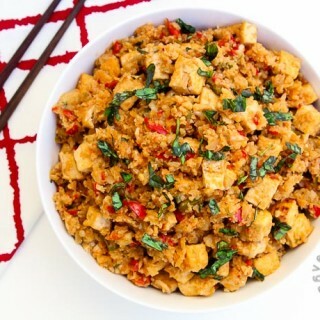 Cashew is always gives wonderful taste in every dish:) I love to try this out! Thanks Vanessa, you'll love these beans for your next taco night! Let me know if you try them out! We've had this many times and love it! great addition of cashew butter. Cashews are toooo expensive in South Africa so I made it with peanut butter and a little tobasco - has a bit of a Satay vibe to it but damn AWESOME. Awesome! So great to know that this works well with peanut butter instead of cashews! Sounds like a great alternative...I'll have to try it next time. Glad you loved it!